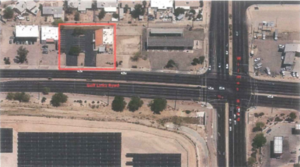 TUCSON, Arizona — Seoul Kitchen Corporation of Tucson (Yeon Suk Choi, manager) bought the former Third Base Bar at 6255 E Golf Links Road in Tucson for $300,000 (85.59 PSF) from Robert T. Kramber. Seoul Kitchen Korean BBQ’s first restaurant in Tucson opened in October 2009 at 4951 E Grant Road in Crossroads Festival Shopping Center at the northeast corner of Grant and Swan (between Alphagraphics and Quizos). Seoul Kitchen offers classic Korean BBQ all for a classic economical Korean budget! The varied menu is always changing. The 3,505-square-feet of building was built in 1965 on .42 acres and will be a second Seoul Kitchen location once tenant improvements are complete. Juan Teran with Realty Executives Tucson Elite represented the seller and Bob Nevins with Nevins Service Realty represented the buyer n this transaction. For more information, Teran should be reached at 520.284.9937 and Nevins is at 520.298.6919. To learn more, see RED Comp #4910.